In the international drive to curb Iran’s nuclear program, the U.S. may find itself increasingly being pulled in two different directions — not only by Israel and Europe, the former inching more and more toward military action while the latter insists on using sanctions — but by two other players with high stakes in the region: Russia and the Gulf states. The growing prospect of an Israeli or U.S. military strike on Iran has raised concern among the six states of the Gulf Cooperation Council — Bahrain, Kuwait, Oman, Qatar, Saudi Arabia and the United Arab Emirates — that they could be targeted by Tehran in the event of war, a scenario which Iranian leaders have threatened several times in the past. But, while the GCCl’s leaders have said they hope to avoid conflict, they also view increasing Iranian influence in the region to be just as worrying, if not more. And it is no secret that they have sought stronger action, including military force, against Tehran. Last year, WikiLeaks cables revealed that Gulf leaders wanted Washington to bomb Iran’s nuclear facilities, secretly urging the U.S. to “cut off the head of the snake.” A shared fear over Iran’s nuclear program has made Israel and the Gulf states unlikely partners in their push to stop Tehran. The U.S. has therefore had to contend not only with Israeli pressure for stronger action on Iran, but also with mounting pressure from the Gulf states. A big difference between Israel’s situation and that of the GCC, however, is that Israel is more capable of defending itself against Iran, while the Gulf states — much more vulnerable to Iran due to their proximity to the Islamic Republic, among other reasons — have long relied on Washington to protect them. Standing on the other side of this international gridlock over Iran is Russia. While the Gulf states want the U.S. to do more against Tehran, the Russians are not leaving Washington with much wiggle room: They refuse to back military incursions against Iran while also vowing to reject further economic pressure on the Islamic Republic. 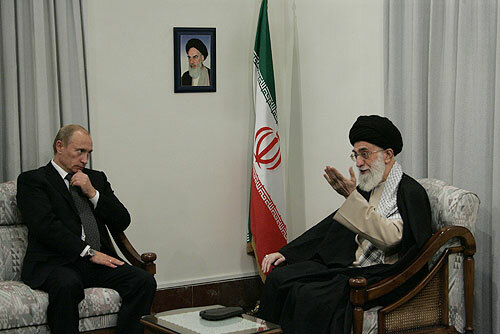 Moscow’s views on the Iranian issue are shaped by many factors, such as its oil, gas, and energy interests in Iran. But, perhaps more importantly, its policy on Iran is an extension of its desire to exert, or revive, Soviet-era influence in the Middle East. “Iran represents a valuable asset in the considerations of the Russian-Chinese alliance, particularly in confronting the North Atlantic Alliance [NATO], be this ideologically, at the intelligence level, in terms of oil interests, or within the framework of the world order,” Raghida Dergham, a columnist for the Al-Hayat pan-Arab newspaper writes. Then there is the issue of events in Libya. Russia claims that the U.N. resolution that paved the way for NATO’s attack on Libya last year was abused to topple Moammar Gadhafi’s regime, and that the West is trying to repeat these events in Syria and Iran. Feeling deceived by NATO’s actions in Libya, Moscow has vowed not to go down this path again. The divergent positions on Iran by Russia and the Gulf states have placed the U.S. in the middle of a tug-of-war of sorts and have forced the Obama administration to confront several questions and challenges in its policy on Iran. If the U.S. decides to impose harsher sanctions on Iran, without the support of Russia, and by extension China, as they are closely aligned, the sanctions may ultimately prove ineffective. “If the sanctions are only partial, backed chiefly by the EU and the U.S., perhaps with the support of South Korea and Japan, then the Iranians will not feel pressured, despite the fact that their economy will be hurt,” says Dore Gold, Israel’s former ambassador to the U.N., the head of the Jerusalem Center for Public Affairs and an Israel Hayom columnist. Iran therefore would likely perceive this as a green light to continue its nuclear plans. If Washington decides instead to move forward with military action against Iran, but without the full support of the U.N. Security Council, aside from an Iranian counter-attack, this could risk provoking Russia. Russian Ambassador to NATO Dmitry Rogozin recently said Moscow sees a military attack on Iran’s nuclear program as a threat to Russia’s national security. Former Joint Chief of Staff of the Russian Armed Forces Col. Gen. Leonid Ivashov took this a step further and even said earlier this month that Russia stands ready to use military force to defend Iran. A nuclear Iran is frightening enough — imagine how much more dangerous a Russian military-backed Iran would be. And if the U.S. decides both against harsher sanctions and military action on Iran — due to lack of universal support — what will Washington do to ensure the safety and stability of the Gulf states in the face of a hostile and an increasingly nuclear Iran? If it decides to take a chance on the current sanctions, hoping that they cause enough damage to force Iran to change course on its nuclear program, the U.S. may lose time. Moreover, the sanctions might ultimately not deter Iran. In the meantime, Tehran would have the time to bury its entire nuclear program deep underground, making the country virtually unstoppable in its nuclear development. Saudi Arabia could then start developing its own nuclear program, as it has repeatedly warned it would do if Iran obtained a nuke, therefore raising the specter of a full-on nuclear arms race in the region. Alternatively, to obtain more robust support for its policy on Iran, the Obama administration could to try to win over Russia and China. In an op-ed published earlier this month in The New York Times, former Mossad chief Efraim Halevy suggests the U.S. offer incentives to Russia to stop defending the Assad regime in Syria. Assad’s downfall alone, Halevy says, could greatly weaken Iran. “Russia simply wishes to maintain its access to Syria’s Mediterranean ports in Tartus and Latakia and to remain a major arms supplier to Damascus. If Washington is willing to allow that, and not to sideline Russia as it did before intervening in Libya, the convergence of American and Russian interests in Iran and Syria could pave the way for Mr. Assad’s downfall,” Halevy writes. This wouldn’t be the first time the U.S. presented Russia with favors in return for its support on Iran. Dore Gold says that at the beginning of Obama’s term, Washginton offered Russia a quid pro quo: The U.S. would scrap its missile defense shields in Eastern Europe, and in return, Russia would back the fourth round of sanctions against Iran. While that deal was successful, Gold says the Russians have “been dragging their feet” on a fifth round of sanctions. Perhaps, then, Moscow is just waiting for the U.S. to up the ante. What emerges from all these scenarios is a simple conclusion: Faced with deciding whether to confront Iran with Russian support or without it, the U.S. must go with the first option if it wants any real chance of stopping, through economic, military or other means, Iran’s march toward a nuclear bomb.